Posted on June 5, 2015 December 18, 2015 , in Hydrobrush, Hydrorake, Moffett. We are happy to announce our new and improved website. It is now designed to meet the needs of all our visitors no matter which device you are using. Our new site is more user-friendly and easy to read as it adjusts to the screen of any device from desktop computers to tablets and mobile phones. This small and lightweight forklift is the perfect year round equipment for deliveries on paved and semi-rough surfaces. It is easily integrated with your current truck or trailers. It is built with the same quality and performance that is found in all of the Moffett equipment. For companies that want a lightweight forklift to deliver more product with fewer trucks, the Moffett M4 32.3P is the ideal choice to get the job done. When a rugged forklift is needed for the job, the Moffett M5 50.3PL is the one to be relied on, and is a lighter version of the Moffett M8 55.3PL model. With its pantograph and Patented Lift Assist®features, M5 50.3PL is a long reach forklift that allows true same-side loading and unloading of trucks and trailers. The Moffett M5 50.4 four way load handling capabilities make it the ideal choice for construction and building supply firms handling long loads. The M5 509.4 easily handles long loads maneuvered through narrow doorways and in tight spaces, while rough terrain poses no challenge for this forklift. Moffett M8 80.4 (4 Way) This heavy capacity 4 Way Moffett is up for any challenge that even the toughest job site can throw at it. The M8 80.4 is the highest capacity multidirectional heavy duty truck mounted forklift available in Canada. It boasts four way capabilities with improved stability and is relied on to get the job done quickly, efficiently and cost effectively in many different industries. You’ll want to check out Atlas Polar’s two new videos on its Hydrorake trash cleaning product pages; one on the Hydrobrush and the other on the Hydrorake ST9000. Now, fish monitoring and transfer facilities can easily comply with the fish and wildlife protection regulations when using the Hydrobush cleaning system. This fully automatic PLC controlled system has the ability to adapt to various depths with a rising floor, while maintaining constant screen pressure through its hydraulic system. The Hydrobrush HB9100 will automatically clean the screens while working horizontally under the waterline. This automatic cleaning ensures constant flow through the screens. The Hydrobrush screen cleaner system has the ability to reduce site operations and maintenance costs. It is perfect for fish monitoring or transfer facilities, as well as water pump facilities. The Hydrorake ST9000 is the industry standard for trash raking systems fully capable of cleaning any gauge screen or bar rack. No matter what the weather conditions, the Hydrorake mimics the handraking action automatically, 24/7. This means greater flow efficiency and a reduction in operational costs. Safety is enhanced and staff morale is improved with this automatic system in place. 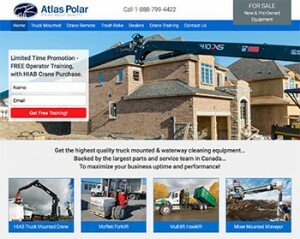 Be sure to take your time to browse around our updated Atlas Polar site to see all the great information that we have to offer and how we can make your next job a whole lot safer, easier and cost effective.